It’s time to showcase your work or share important news or announcements with your followers on Instagram, and using Instagram stories is a great, quick way to get your message out to them. Whether it’s a new blog post, giveaway announcement, photoshoot preview, important update teaser, etc., your followers will want to know. Stories keep your content top of mind for your followers, and using them helps boost your reach and engagement! Your followers are likely watching your stories, and stories are a great tool to remind followers again of what you are up to and direct more traffic back to your stand-alone posts on your grid. Customizing your own IG stories is a great way to convey the strength of your brand. By usings your own brand identity fonts, colors and patterns you can show yet another extension of how you show up in a consistent way. Having your own Instagram Stories template is a powerful way to will increase your engagement, and grow your business. Give your instagram account a major boost and pop in your own images and text and save. Creating your own Instagram stories template doesn’t have to be frustrating, though! 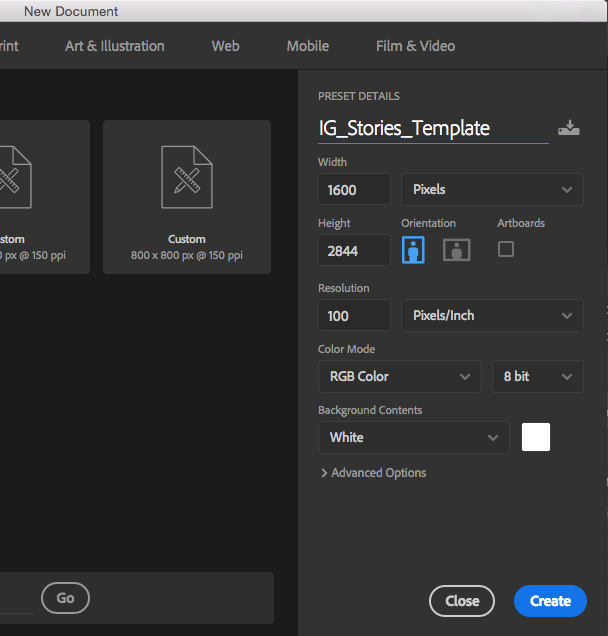 Here is a simple, step-by-step breakdown on how to create a simple but unique Instagram stories template in Photoshop! As mentioned in my last post, Photoshop is the quickest way to make this happen. You can create ONE layered file, simply change what you need at any given time, and then save out separate flattened files to pop into your feed as you wish! Today I'm going to show you one of the easiest ways to make your custom template. But first, remember. Do not be intimidated by Photoshop! Use the paint bucket tool to set your colors. Click on the Paint Bucket Tool in the tools on the left. Then, click the Set Foreground Color box to get the colors to pop up. Choose a color from your brand identity color palette. Click OK.
To add your wording, now use the text tool. Click on the Horizontal Type Tool in the tools on the left. Click in the middle of your document or where you want the words to go. It automatically creates a new Type Layer. Don’t forget to use your brand identity fonts! Begin typing your words. Select your text and adjust the font, style, size, paragraph orientation, etc in the toolbar along the top. Leave blank space for your IG handle in the design. 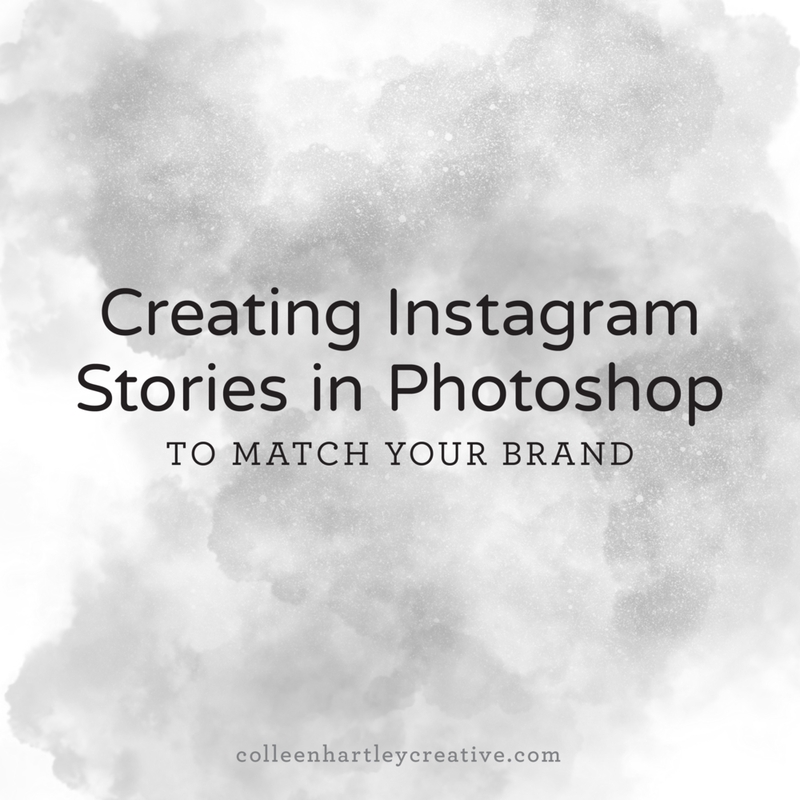 Instead of typing in your Instagram handle (@colleenhartleycreative) in your image for Instagram Stories, I would leave SPACE for adding in your Instagram handle for after you upload it. After you Export your image and then upload it to Instagram, you can add your CLICKABLE handle on top of this image. Now, to add your logo or any other image. Open your logo file in Photoshop. Have both the template and the Logo file next to each other in separate files. With the Move Tool selected, select the layer that the logo is on and physically drag it onto your Instagram image. The logo is now it's own layer in your layered Instagram template Photoshop file. Save your file for Instagram. Save the original layered file as .psd file, then save it in a location you can remember! Turn off the layers in your Layers palette that you do not want to be seen in the final artwork. Do this by clicking the small eyeball tool to the left of each layer in your Layers palette. Then click File > Export > Save for Web. Then click File > Export > Save for Web. Click Save. Then save to a specific folder to add to social. Save in a location where you can access it on your phone. Examples: Google Drive, Dropbox, etc. Navigate to image on your phone. Save it to Photos on your phone. To export as a .png, click File > Export > Quick Export as .png. Be sure to edit or hide layers as needed. Tip: Include the month and/or day in the file name. Then save to a specific folder to add to social. Save in a location where you can access it on your phone. Examples: Google Drive, Dropbox, etc. Need help with file types? Learn more about the fundamentals of Photoshop here! Or, download this simple cheat sheet all about different Photoshop file types! Don't want to make your own template? I've created an easy-to-edit one for you! Click here to get the FREE template!